The Speedbox LTE mini II is a new portable router for Germany Telekom, which has great improvement from its predecessor especially at speed. Because the new router is based on LTE CAT6. This compact device can be used both for home use, as well as for the road. Here are the technical data at a glance. In January 2013, Speedbox LTE mini came out. Again, a model was used as the previous model, which is based on a device from Huawei. The model number is Huawei E5786. Instead of LTE category 4 with the frequency bands 800/900/1800/2100/2600 MHz, the Speedbox LTE mini II is now with Category 6 and supports more bands with additional 4G at 850 MHz. Thanks to LTE CAT6, a maximum download rate of up to 300 Mbit/s is possible, which is twice the first Speedbox LTE mini. In addition to the normal Speedbox II, this is the first LTE-Advanced router available in Germany. The particularly fast standard 802.11ac allows here a data transfer of up to 433 Mbit/s, while the module sends on 2.4 GHz and 5.0 GHz. The capacity of the battery was 3,000 mAh available. The dimensions remained almost the same as E5786, only the weight more slightly to 5 grams. The Speedbox Mini LTE is powered by a new chipset from Huawei HiSilicon, which comes along in 28-nanometer architecture Cortex-A9 architecture and allows the use of LTE CAT6. Furthermore, if the high-speed internet is not available, you can also rely on HSPA (+) with up to 43.2 Mbit/s, and EDGE and GPRS are also supported. The small dimensions make the Mini-Router an ideal travel partner. 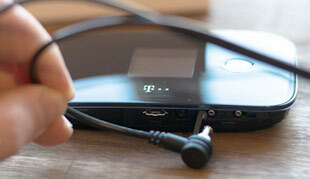 At the same time, the device has a hotspot feature that allows up to 10 other terminals to access the Internet. It’s perfect to use it in apartments without power, or in the car etc. 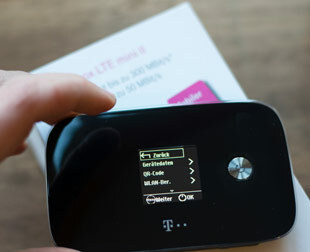 The Speedbox LTE mini II can be ordered at Germany Telekom since mid-September 2014. At the Telekom, it will not only provides the network operator logo on the surface, a software-branding is also available. Thus for example, the wireless repeater function of the E5786 has been disabled. If you know the difference between the Speedbox LTE Mini II with E5786, you many prefer the unbranded Huawei E5786 with full functions activated. Without any SIM lock, you can take the pocket WiFi anywhere!